Objective To investigate regional variation in the registration of preterm births <24 weeks of gestation and the impact on infant death rates for English Primary Care Trusts (PCTs). Participants All registered births (1 January 2005–31 December 2008) by gestational age and PCT (147 trusts) linked to infant deaths (up to 1 year of life). Late-fetal deaths at 22 and 23 weeks gestation (1 January 2005–31 December 2006). Main outcome measures Extremely preterm (<24 weeks) birth rate per 1000 live births and percentage of births registered as live born by PCT. Infant death rate and rank of mortality for (1) all live births and (2) live births over 24 weeks gestation by PCT. Results Wide between-PCT variation existed in extremely preterm birth (<24 weeks) rates (per 1000 births) (90% central range (0.31, 1.91)) and percentages of births <24 weeks of gestation registered as live born (median 52.6%, 90% central range (26.3%, 79.5%)). Consequently, the percentage of infant deaths arising from these births varied (90% central range (6.7%, 31.9%)). Excluding births <24 weeks, led to significant changes in infant mortality rankings of PCTs, with a median worsening of 12 places for PCTs with low rates of live born preterm births <24 weeks of gestation compared with a median improvement of four ranks for those with higher live birth registration rates. Conclusions Infant death rates in PCTs in England are influenced by variation in the registration of births where viability is uncertain. It is vital that this variation is minimised before infant mortality is used as indicator for monitoring health and performance and targeting interventions. Research has shown differing birth registration practices to impact on international comparisons of infant mortality. Infant mortality varies widely between PCTs in the UK and has been suggested to reflect case mix and effectiveness of local antenatal and neonatal services. Within countries, variation in decision making regarding the registration of births where viability is uncertain may also bias regional comparisons. Wide differences exist in the reporting of preterm births <24 weeks of gestation as live or stillborn between PCTs. Variation in registration practices impact greatly on regional infant death rates in England and must be minimised before comparisons of infant mortality are made. Excluding preterm births <24 weeks of gestation from infant death rates is an initial aid for healthcare commissioners and service providers to work towards improvements in care. 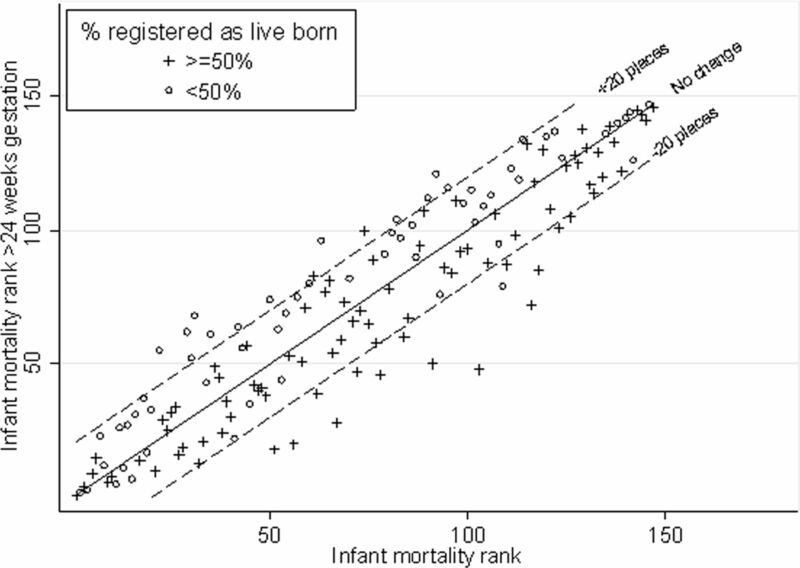 Despite overall improvements in infant mortality, wide variation exists between similarly developed countries.1 ,2 International variations in birth registration practices have been shown to have a major influence on infant mortality rankings1 ,3 ,4 and there is a need to distinguish between ‘real’ variations and those arising from artefactual differences. Registration disparities mainly relate to births of uncertain viability when definitions of late-fetal death and live birth are particularly complicated. Changes in views on the limit of viability have led to increases in registered live births less than 24 weeks gestation. 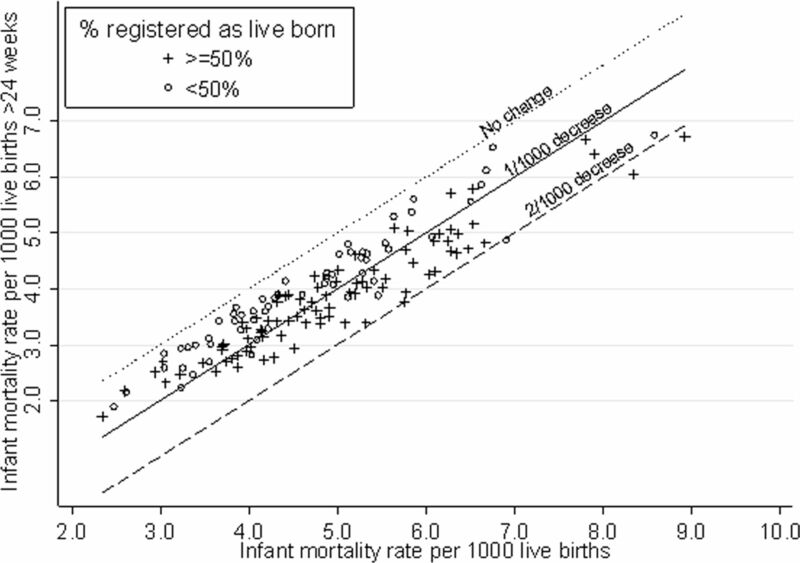 However, survival of these infants remains poor5,–,9 and they impact greatly on death rates, accounting for 20% of neonatal deaths in England.5 Where significant differences exist in the interpretation of what constitutes a live birth between countries, regions or hospital units, comparisons may be of limited value since standard published infant death rates only include live births and in England there is no legal requirement to register fetal deaths before 24 weeks' gestation. We use data from England's PCTs to explore variation in the registration of babies born before 24 weeks of gestation and its impact on infant death rates at PCT level. PCT-level data on all registered births and linked infant deaths (death before 1 year of life) in England by gestational age (<24 weeks, 24–27 weeks; 28–32 weeks; 33–36 weeks; 37+weeks) for 1 January 2005 to 31 December 2008 were obtained from the Office for National Statistics (ONS, http://www.statistics.gov.uk). Four of the 151 PCTs were excluded for high levels of missing gestational age (13%–82% missing: n=14917) (0.3% overall). Fetal deaths less than 24 weeks' gestation are not registerable in England but the Centre for Maternal and Child Enquiries (http://www.cmace.org.uk) collected national voluntary data on 22 and 23 weeks gestation deaths until 31 December 2006 when data collection ceased. Information by PCT for 1 January 2005–31 December 2006 were used to estimate the deaths for the 4-year period and estimates were compared with those based on deaths for 1997–2006. The gestation-specific birth rate for live born infants (denominator: all live births). The gestation-specific birth rate for all infants (denominator: all live and stillbirths and late-fetal deaths). The gestation-specific percentage of infants registered as live (denominator: gestation-specific live births and stillbirths/late-fetal deaths). For each measure, the median, IQR and 90% centile range were calculated by gestational age and PCT. Binomial regression models were fitted with PCT included as a random effect to compare the variation in gestation-specific rates between PCTs. These models enable the exploration of between-PCT variation in excess of that expected by chance, accounting for differences in sample size. The SD of the random effect for PCTs was compared across different gestational ages, with a lower SD suggesting greater homogeneity between PCTs. Models were then adjusted for maternal age and ethnicity based on census data and socioeconomic deprivation, measured using the area-level index of multiple deprivation 200712 (population-weighted average of super output areas in each PCT). The median, IQR and 90% centile range for the proportion of infant deaths of <24 weeks' gestation were calculated by PCT to assess variation in the contribution of these deaths to overall infant mortality. For each PCT standard infant death rates were calculated (denominator: all live births) and then recalculated excluding births where clinical decision making was most prone to variation (births <24 weeks gestation). Sensitivity analyses excluding births <28 weeks' gestation were also undertaken. For each PCT, the absolute change in infant mortality and the change in rank before and after excluding preterm births <24 weeks of gestation were calculated. Changes in infant mortality were compared between PCTs with a high (≥50%) or low (<50%) percentage of preterm births <24 weeks of gestation registered as live born. There were 2 535 855 live births, 13 112 stillbirths and 2382 estimated late-fetal deaths (147 PCTs). Wide between-PCT variation existed in extremely preterm live births (<24 weeks) (figure 1) with a sixfold difference in the 90% centile range (0.31 to 1.91 per 1000 births). 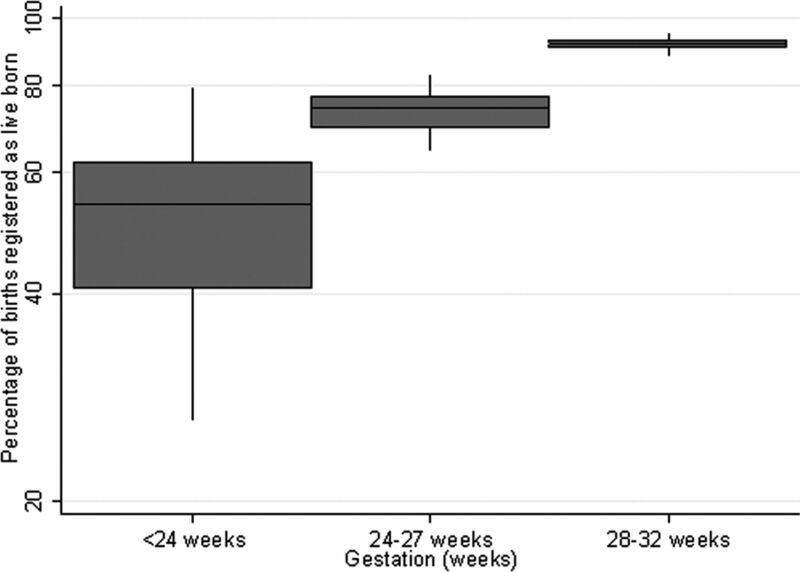 This decreased with increasing gestation, with twofold and 1.5-fold differences at 24–27 and 28–32 weeks gestation, respectively (90% centile range: 24–27 weeks: 2.48 to 5.26; 28–32 weeks: 10.24 to 15.75). This pattern was confirmed by binomial regression models (table 1) with decreases in the between-PCT SD with increasing gestation. After adjusting for socioeconomic deprivation, ethnicity and the age distribution of women in the PCT, the between-PCT variation was reduced but remained high in the extremely preterm group. Median, IQR and 90% centile range of rate of preterm birth (live births and all births) by gestational age for Primary Care Trusts (log scale). The overall rate of very preterm birth by gestational age (total births including fetal deaths) showed a reduction in the between-PCT variation in preterm births <24 weeks of gestation but little change at later gestations. There was a fourfold difference in the 90% centile range for those <24 weeks gestation (0.93 to 3.25 per 1000 births) compared with a twofold difference at 24–27 weeks (3.54 to 7.00) and 1.5-fold at 28–32 weeks (11.17 to 17.13 per 1000 births) (figure 1). Binomial regression models confirmed this pattern of variation between PCTs with reduced SD for the logarithm of the birth rate for all births compared with live births. The SD again decreased with increasing gestation (table 1). 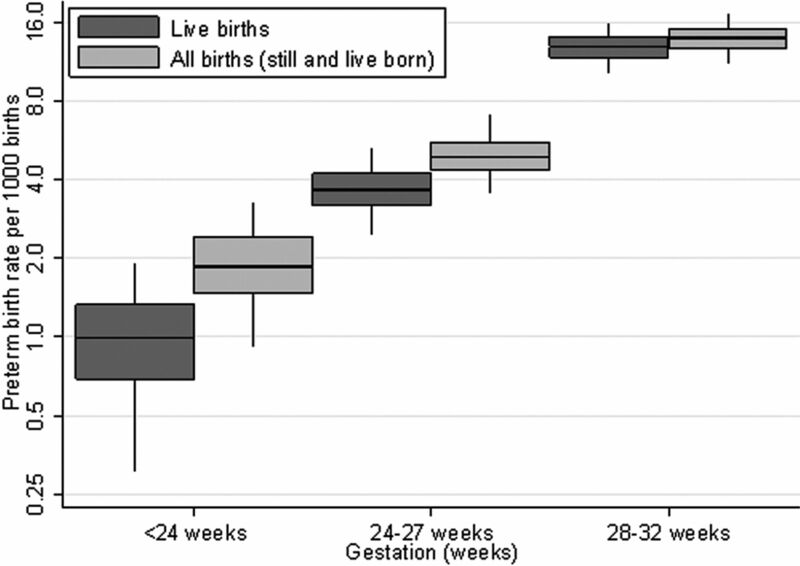 The percentage of births recorded as live increased with increasing gestational age from 52.6% at <24 weeks to 73.9% at 24–27 weeks and 91.9% at 28–32 weeks gestation (figure 2). The variation at <24 weeks was wide with a 90% centile range of 26.3% to 79.5%, that is, in the lower 5% of PCTs, around a quarter of births were registered as live born compared with over three quarters in the upper 5% of PCTs. This variation reduced considerably with increasing gestation as seen in figure 2 (90% centile range 24–27 weeks: (64.4% to 82.9%); 28–32 weeks: (88.5% to 95.4%)). Binomial regression models (table 1) confirmed this pattern of decreasing between-PCT variation in the percentage of births registered as live born with increasing gestation. Adjusting for PCT population characteristics resulted in little change in the between-PCT variation for all gestational age groups. Median, IQR and 90% centile range for the percentage of preterm births registered as live born by gestational age for Primary Care Trusts (log scale). The infant death rate was 4.78 per 1000 live births (n=12083). This varied widely between PCTs from 2.34 to 8.93 per 1000 births. Despite making up only 1% of births, 19.5% of infant deaths arose from births <24 weeks gestation. Between PCTs this varied considerably (90% centile range (6.7% to 31.9%)). Comparing the overall infant death rate versus the infant death rate excluding preterm births <24 weeks of gestation (figure 3) showed a decrease in infant mortality of more than one death per 1000 births after exclusion of preterm births <24 weeks of gestation in 60 out of the 147 PCTs. Of these 83% registered more than half of preterm births <24 weeks of gestation as live born. Conversely of those 87 PCTs which had a smaller decrease in infant mortality (≤1 death/1000 births), only 43% had registered over half of preterm births <24 weeks of gestation as live born. Looking at the median change in ranks after excluding preterm births <24 weeks of gestation (figure 4) showed a worsening of 12 places for PCTs that registered less than half of preterm births <24 weeks of gestation as live born compared with an improvement of four ranks for those that registered at least half of births as live born. Overall infant death rate versus infant death rate excluding infants less than 24 weeks gestation for Primary Care Trusts by percentage of births less than 24 weeks gestation registered as live born. Lines indicate an absolute difference of one death and two deaths per 1000 live births. Rank of overall infant death rate versus rank of infant mortality excluding infants less than 24 weeks gestation for Primary Care Trusts by percentage of births less than 24 weeks registered as live born. Lines refer to an absolute increase and decrease of 20 places in rankings, 1=lowest death rate, 147=highest death rate. Analyses excluding infants <28 weeks' gestation showed similar findings. Further analyses using estimates of late-fetal deaths based on 1997 to 2006 data, showed a stronger relationship between the percentage of births registered as live born <24 weeks gestation and changes in both infant death rates and ranks when excluding births <24 weeks. Although missing gestational age data may be more common in earlier gestations, analyses assuming that the rate of missing data was 100 times higher in the earliest gestational age group (<24 weeks) had little effect on the results seen here. Our study has shown wide variation in the rate of extremely preterm live births between PCTs in England that are not explained by population case mix. We highlight substantial differences in the reporting of preterm births <24 weeks of gestation as live births or late-fetal deaths. These registration differences have a major impact on infant death rates. The exclusion of preterm births <24 weeks of gestation leads to significant improvements in rankings for PCTs which register high numbers of extremely preterm infants as live born. These findings are of key importance to healthcare commissioners and service providers making regional comparisons and targeting interventions to improve care. We demonstrate that registration differences impact on within-country comparisons as well as between countries. In order to make direct comparisons in mortality, be it international, regional or unit level, it is essential there is detailed validation and standardisation to ensure we are comparing ‘like with like’,3 distinguishing ‘real’ variation from ‘artefacts’ that arise from reporting and registration differences.13 In the US, despite the implementation of national reporting requirements, clinical decision making based on definitions of viability do not match clinical decision making14 and variation exists in state registration practices15 similar to that shown here. A standardised approach to the collection, calculation and presentation of death rates is required to reduce artefactual differences.16 In the UK, although peer groups of PCTs have been introduced to adjust for differences in case-mix, it is vital that registration differences are minimised before comparisons of mortality are made. Variation in the rate of live births at less than 24 weeks gestation and the proportion of births registered as live born may reflect true underlying differences in the extremely preterm birth rate and fetal death rate between PCTs. However, after adjusting for underlying aetiological differences such as socioeconomic deprivation, ethnicity and maternal age, wide variation between PCTs persisted in this early gestational age group. Furthermore, considerably less variation between PCTs was seen at later gestations and we are unaware of the reporting of any particular approaches to care and improved overall outcomes that such between-PCT variation could be attributed to. The variation we demonstrated is also unlikely to be due to different calculation methods of gestational age between PCTs with the increasing use of obstetric dating scans. If the wide variation in extremely preterm live births is due to random chance, their dramatic impact on death rates suggest they should be excluded from published statistics. Information on gestational age at birth has been collected since 1 January 2005 with the introduction of the National Health Service numbers for data of babies. Our study used the most recent data available but confidentiality restrictions prevented exploration of time trends. Changes may have occurred in the registration of births over time as views on the viability of extremely preterm infants modify and this may vary systematically between PCTs. As more data become available, the opportunity to update these results will arise. Data on late-fetal deaths for the complete study period were not available and we were limited to national voluntarily reported data at 22- and 23-week gestation deaths. However, live births less than 22 weeks gestation are extremely rare. Geographical variations may exist in the reporting of late-fetal death data but we could not validate this using ONS data since they are not registerable deaths. There are many risk factors for extremely preterm birth and infant death that we could not take account of here. We adjusted for similar measures to those identified by Freemantle et al10 to explain between-PCT variation in infant mortality. Deprivation was measured at PCT level and this may not reflect the pattern of deprivation in PCTs, however we undertook sensitivity analyses incorporating measures of the heterogeneity in deprivation within PCTs and this showed similar results to those seen here. Where underlying regional or international differences over decisions regarding the viability of preterm births <24 weeks of gestation exist, standard published mortality statistics will be prone to bias. In England, when comparing PCTs with similar population mix to compare performance, excluding births less than 24-weeks gestation from infant death rates may be an initial quick fix to minimise this problem. However, this would mean the exclusion of up to a third of infant deaths in some areas. The resumption of collection of detailed information on late-fetal deaths at 22 and 23 weeks is vital and the gestational age for statutory registration of stillborn infants may benefit from re-evaluation. This move alone would remove the problem of variation between areas in relation to measures such as perinatal mortality which would currently suffer the same regional variation seen here in infant mortality. This step will improve our ability to investigate within-country differences and allow for direct international comparisons, particularly in Europe where the vast majority of countries register all births from 22 weeks gestational age. Such an approach would seem sensible for all developed countries. Ultimately, we need to work towards reducing the variation in the registration of extremely preterm infants in England. Research into understanding how this variation arises and improving consensus on guidelines regarding viability of infants less than 24 weeks would be steps towards this goal. This article presents independent research commissioned by the National Institute for Health Research (NIHR) under its Programme Grants for Applied Research funding scheme (RP-PG-0407-10029). The views expressed in this article are those of the author(s) and not necessarily those of the NHS, the NIHR or the Department of Health. The authors also thank members of the NIHR programme grant team: Elaine Boyle, Samantha Johnson and Julie Faulkes (University of Leicester) for helpful advice and comments throughout the study. The authors thank Julie Messer for assistance with the National Numbers for Babies Data and Shona Golightly and Anna Springett (Centre for Maternal and Child Enquiries) for her help with information on late fetal losses. EURO-PERISTAT project with SCPE & Eurocat & Euroneostat. European Perinatal Health Report, 2008. OECD Health data. Statistics and indicators. Paris, 2010.
. Evaluating and comparing neonatal outcomes. Arch Dis Child Fetal Neonatal Ed 2010;95:F158–9.
. Registration artifacts in international comparisons of infant mortality. Paediatr Perinat Epidemiol 2002;16:16–22.
. Survival of extremely premature babies in a geographically defined population: prospective cohort study of 1994–9 compared with 2000-5. BMJ 2008;336:1221–3.
. No improvement in outcome of nationwide extremely low birth weight infant populations between 1996–1997 and 1999-2000. Pediatrics 2007;119:29–36.
.; Extremely Preterm Infants in Belgium Study Group. The EPIBEL study: outcomes to discharge from hospital for extremely preterm infants in Belgium. Pediatrics 2004;114:663–75.
. Extremely growth-retarded infants: is there a viability centile? Pediatrics 2006;118:758–63.
. Non-viable delivery at 20-23 weeks gestation: observations and signs of life after birth. Arch Dis Child Fetal Neonatal Ed 2003;88:F199–202.
. What factors predict differences in infant and perinatal mortality in primary care trusts in England? A prognostic model. BMJ 2009;339:b2892.
. The perinatal mortality rate as an indicator of quality of care in international comparisons. Med Care 1998;36:54–66.
. The English Indices of Deprivation 2007. London: Department for Communities and Local Government 2008.
. Methodological difficulties in the comparison of indicators of perinatal health across Europe. Eur J Obstet Gynecol Reprod Biol 2003;111(Suppl 1):S33–44.
. The definition of life: a survey of obstetricians and neonatologists in New York City hospitals regarding extremely premature births. Matern Child Health J 2011;15:446–52.
. Variation by state in outcomes classification for deliveries less than 500 g in the United States. Matern Child Health J 2011;15:42–8.
.; MOSAIC research group. Investigating the variations in survival rates for very preterm infants in 10 European regions: the MOSAIC birth cohort. Arch Dis Child Fetal Neonatal Ed 2009;94:F158–63.
. Attitudes to viability of preterm infants and their effect on figures for perinatal mortality. BMJ 1990;300:434–6.
. Socioeconomic inequalities in very preterm birth rates. Arch Dis Child Fetal Neonatal Ed 2007;92:F11–4. Funding UK Department of Health's National Institute of Health Research. Competing interests All authors have completed the unified competing interest form at www.icmje.org/coi_disclosure.pdf (available on request from the corresponding author) and declare: all authors had financial support from UK Department of Health's National Institute of Health Research for the submitted work; no financial relationships with any organisations that might have an interest in the submitted work in the previous 3 years; no other relationships or activities that could appear to have influenced the submitted work.